At the forefront of the fight against child mortality and morbidity, India is leading the global community in placing a renewed emphasis on this important mission. India’s Call to Action demonstrates leadership and commitment to both the global community and the children of India. India has an opportunity to make great gains on child survival with increased commitment and funding for the most effective life-saving practices. Moreover, India’s unique culture of social entrepreneurship, innovation, and technological advances present a historic opportunity to accelerate progress in reducing childhood illness and death. India is a regional leader and can guide and support other countries in several ways. We commend the progress India is making in tackling child survival and strengthening India’s health sector. India is one of the countries to have significantly reduced the incidence of HIV – from 0.41 percent in 2002 to 0.27 percent in 2011. India has reduced its maternal mortality by more than 50 percent – from 570 in 1990 to 212 in 2009 per hundred thousand live births – and child mortality by 45 percent from 119 in 1992 to 59 per thousand live births in 2012. The United States has been a longstanding partner of the Government of India, and our relationship dates back more than six decades. 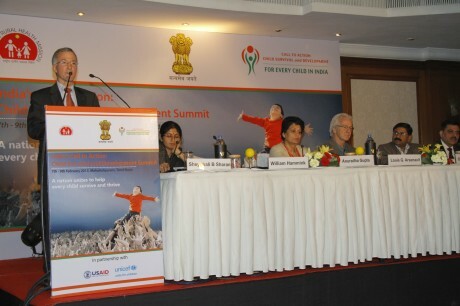 The U.S. Government through its agencies including the United States Agency for International Development, and the Centers for Disease Control and Prevention has been actively engaged in working alongside the Government of India as it endeavors towards ending preventable child deaths within a generation. In recent years, USAID has made significant investments in the area of reproductive, maternal, newborn, and child health, nationally and in key Empowered Action Group States. USAID is currently developing its five-year Country Development Cooperation Strategy, while continuing to provide targeted assistance to support flagship national health programs, it will increasingly adopt methods focused on innovation and partnerships: more directly engaging local partners; leveraging co-financing instead of fully funding agreements; and developing platforms and alliances to generate development outcomes that encompass multiple organizations. The U.S. Government is proud to be a part of this initiative and to give our unwavering support to India’s Call to Action. In the coming months, USAID will look at opportunities for newer partnerships with multi-stakeholder engagement including the government, private sector, entrepreneurs, and civil society to identify, and scale up solutions to address the challenges in accelerating child survival efforts. As USAID Administrator Raj Shah said in his welcome letter to Summit participants: “An investment in India’s children is an investment in India’s future.” We stand ready to be part of India’s tomorrow. J’Ai vu la Photo Des enfants La Haut sur Cette page Avec leur visage Resplendissant de joie. Je Pense Qu’ ils veulent dire nous Sommes Contents Parce Que nous Allons A L’école, le professeur nous montre de Bonnes et de belles Choses. Je vous Souhaite bon travail, bonne continuité! This is terrific. Thank you Bill.